Teams often want up to date realistic data, on demand to test code and deliver value quickly. However, DBAs have to account for all database copies and ensure personal information is protected and sanitized, specifically for non-consented use. 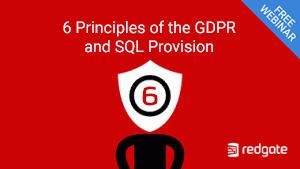 Join our webinar to learn from MVP Steve Jones how SQL Provision, Redgate’s newest offering, can help organizations comply with the 6 principles of the GDPR, without slowing down the team.